The second stage of the “Ridiculously Delicious Challenge” hosted by Marx Foods consists of developing your own recipe using two ingredients out of a box sent by Marx Foods. There aren’t many things I like better than receiving a box full of food in the mail, which actually seems to happen to me at a wonderful frequency, so I was a little bit thrilled about this. Upon opening the box last Tuesday, I was greeted with small samples of many exciting spices – including saffron, dried Tepin chilies, and grains of paradise – but the thing that really got me was the dill pollen. Mostly because as soon as I opened the top of the box the scent of dill pervaded my entire apartment. (Thanks to a Christmas gift of lovely glass spice jars from my baby bro, the scent of my apartment has since returned to equilibrium. Thanks Ryan!) While sitting and writing out ideas of different recipes that could incorporate two of the spices in a harmonious way, I could not escape the scent of the dill, and so I was having a tough time imagining saffron scented rice or Tepin chile enchiladas or really anything that didn’t scream of the Great White North. I wanted to come up with a simple but elegant combination that would really show off both the dill and my second chosen ingredient – Szechuan peppercorns. 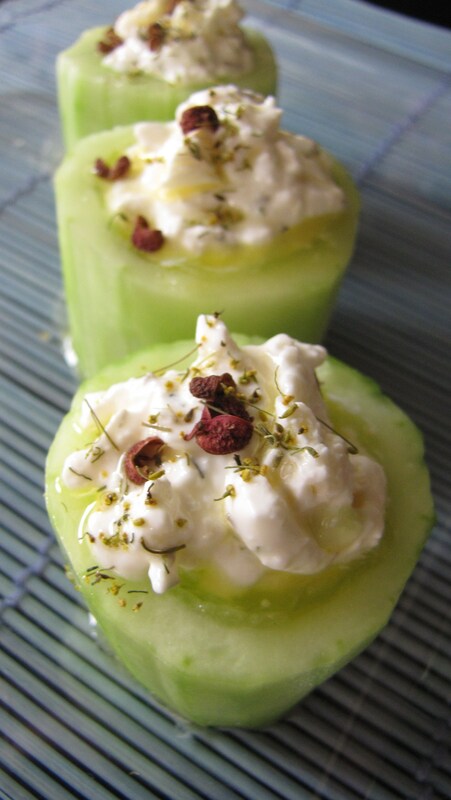 My solution – cucumber cups stuffed with a feta-dill filling and served with a lemon-Szechuan dressing. Really, they came together quite nicely, and even though I did my photo shoot 30 minutes after breakfast (such is the life of a very busy college student with limited daylight hours at home – I also did my hot fudge photo shoot at 9:30 in the morning and ended up eating half of it before forcing myself to stash it in the freezer) I ended up eating the whole tray. These would be lovely as a fresh and bright party appetizer, although the dressing might need to be served on the side for neatness. You will probably need to tinker with the cucumber-filling-dressing ratio until you find your perfect combo, but what I have listed here is a good base. Ridiculously dillicious, you might say. God I love puns. Voting will take place on the MarxFoods website from March 1st to March 4th. Vote here! Makes 1 cucumber’s worth (4-5 pieces). Scale as needed. Peel the cucumber and cut into 1 inch rounds. Scoop out the middle from 1 side of each round, so that the cucumber forms a stand-alone cup. In a small bowl, mix the feta cheese, sour cream, and dill pollen until well combined but not completely smooth. In another small bowl, vigorously whisk the lemon juice and olive oil together until uniform. Add the grated peppercorns a pinch at a time, tasting the dressing between additions, until the spiciness is to your liking. Stuff each cucumber cup with a tablespoon of feta filling. Sprinkle more dill pollen on the top of each cup, and drizzle with dressing. dillicious, indeed :) what an interesting combo! These look good! You’re right about that dill pollen – when I opened that little bag, it was just amazing. These sound amazing. I hope I get to try some at Robbie’s graduation. By that time, you will be well on your way to having your own catering company. I bet the salty feta is a perfect filling for the cucumbers. And with the dill in there too, you can’t go wrong. Great idea! I loved the dill pollen, and what a great way to use it! Fresh, light, and delicious! Yum! hey guess what? up you guessed it I am going to make these for the round 3 challenge…thanks for a good idea! awesome! i’m flattered. i thought your sour cherry ice cream/coconut threads combo was the most creative in the bunch! 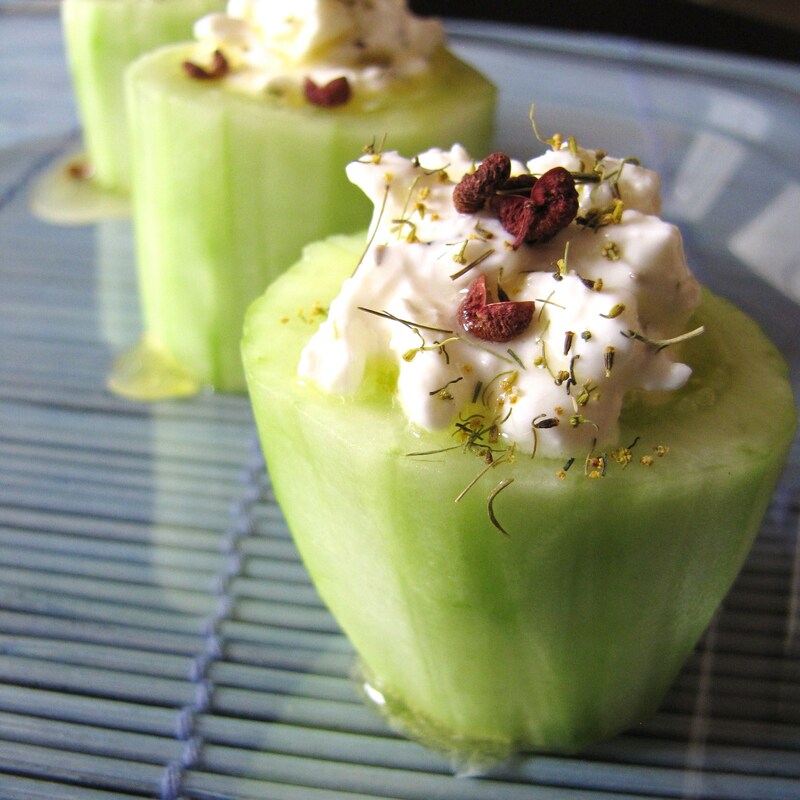 Awesome Cucumber cups and filling…. What a lovely snack. My husband has been away for almost two weeks and will be arriving on Thursday to spend 5 glorious days at home. I’ve been trying to come up with a delicious menu for each night. These will definitely be added to the list.